Placerville, CA – July 31, 2018…The Placerville Speedway is amped up and ready to kick-off the month of August this Saturday with Red Hawk Casino championship point race number 13, which also doubles as “Military Appreciation Night” at the races. Active and former military members will receive admission for just $10 by showing ID on Saturday. Divisions set to tackle the quarter-mile on August 4 include the Thompson’s Auto Group Winged 360 Sprint Cars, Pure Stocks, Wingless Spec Sprints and BCRA Midget Lites. Fans can also save $3 off the ticket price at the gate by dropping off a new, unwrapped toy for the “Toys 4 Tots” program. After winning his second Thompson’s Auto Group Winged 360 feature of the season on July 21 Auburn’s Andy Forsberg has stretched his point lead to 39-markers. Including this Saturday there are five point races remaining in 2018, as Forsberg looks to add a sixth Sprint Car title at the quarter-mile. If he could do so it would match Brian Crockett for the most Winged 360 championships at Placerville Speedway, a record he’s held solely since 1991. The race for second in the standings has closed up once again with Hollister’s Tony Gualda leading Placerville’s own Jimmy Trulli by just seven-points. Gualda has put together a solid season and has continued to be in the mix at every event. The 18-year-old has been knocking on the door of victory lane and if things fall his way late in the race it very well could open on Saturday. Trulli is fresh off a runner up effort last time out and will be gunning for his second win of the year this weekend. Cameron Park’s Shane Hopkins has been impressive as of late and will be another one of the young guns hoping to break their way into victory lane. Despite tough luck the past two week’s it’s been a successful rookie season for Hopkins, who sits fourth in points. Placerville’s CJ Humphreys is coming off a fifth-place effort during the most recent event and now rounds out the top-five in the standings. Placerville’s Mike Cook, Calistoga’s Mike Benson, Foresthill’s Jodie Robinson, Aromas’ Justin Sanders and Visalia’s Steven Tiner complete the top-10. The Pure Stocks have featured some of the best racing this season and are set for their 11th point race of 2018 on Saturday. Scott Grunert continues to lead the points and has even stretched his advantage as of late. Going into the weekend Grunert leads defending track titlist Jason Palmer by 18-digits. Along with Saturday there are just four races remaining before we crown a champion. Kevin Jinkerson, Nick Baldwin and Rick Grunert round out the top-five in the standings. At the last event Ryan Peter earned his long-awaited first career Placerville Speedway victory. Also joining the card during “Military Appreciation Night” will be the Wingless Spec Sprints and BCRA Midget Lites. 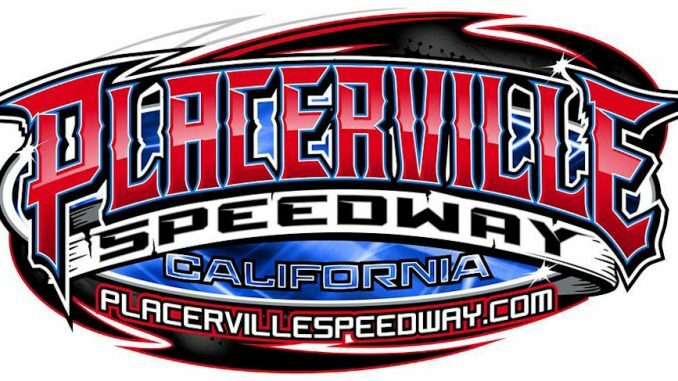 It marks the first of two straight weeks that Placerville Speedway will offer wingless sprint car racing, which always provides excitement on the quarter-mile. For the BCRA Midget Lites it marks their sixth appearance of the season on the red clay. The Placerville Speedway would like to thank all of its partners for their support this season including Red Hawk Casino, Hoosier Racing Tires, Coors Light, Thompson’s Auto Group, Absolute Auto Glass, ADCO Driveline and Custom Exhaust, Bear Republic Brewing, Beef’N’Brew, Capital Ace Hardware, Carol Russell Bookkeeping Service, Campora Propane, Davies Family Inn, High Sierra Industries, Poor Reds BBQ, Les Schwab Tires, the Paint Spot, Riebies Auto Parts, Shadow Ridge Ranch, The Critter Getter, Foothill Tree Service, Mountain Democrat, Union Bank, Windfall Media, Arnolds for Awards, and ArborWorx Tree Service. Join over 10,400 followers of Placerville Speedway on Facebook, where you can keep abreast of updates for the 2018 season. You can also find Placerville Speedway on Twitter by following us https://twitter.com/pvillespeedway – In addition, Placerville Speedway is also on Instagram. Please follow us @PvilleSpeedway.